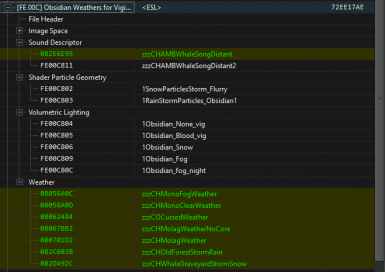 An updated Obsidian Weathers and Seasons patch for Vigilant.esm. VIGILANT SE ESM Version only! The authors of these mods are very generous to make their mods free on the Nexus, therefore you are not allowed to redistribute or monetize their assets in any way. I have made this patch with this in mind, and would openly submit this patch to either mod author's modpage in a heartbeat. I DO NOT OWN ANY OF THESE ASSETS, SIMPLY FORWARD THE CHANGES AND CLEANED UP THE PATCH! Support for Vigilant.esm. Cleaned unused masters (Vigilant.esp). Needs more testing. ﻿make sense if you downloaded this mod and not that one. ﻿install this mod, you'll probably crash on startup. ﻿There are two versions of the mod. The main file is an ESPL-ESPFE, so it won't take a slot in your load order. The optional file is an ESP, for those of you who prefer it that way. It can be safely merged using mator's zEdit alpha. Installation with Mod Organizer 2, or Vortex is recommended. NMM users may have a hard time with the ESPL format.